The One Arm Push Up (OAPU) is one of the best bodyweight pushing exercises. In this post, I am going to give you a complete step-by-step tutorial to help you achieve this awesome movement. There are lots of different variations of the OAPU. In the beginning, I am going to show you the progressions and then I will give you some training plan variations. Caution: If you are not able to complete 30 consecutive push ups with good form, then you will have to train more with the basics. Take a look at the beginner training plan to see how to accomplish this. How Fast Should Your Push Ups Be? These complimentary exercises do not directly lead to the OAPU, but they will help you build the strength of your triceps, chest, shoulders, and core. You should include them in your training for the best results. and most if not all core exercises. In these archer push up progressions, you are going to use both arms, but the one arm will take most of the load while the other one will support. This is very easy to scale. You will have to measure the distance of your hands in the beginning and increase it gradually. Start with arms placed shoulder width apart. 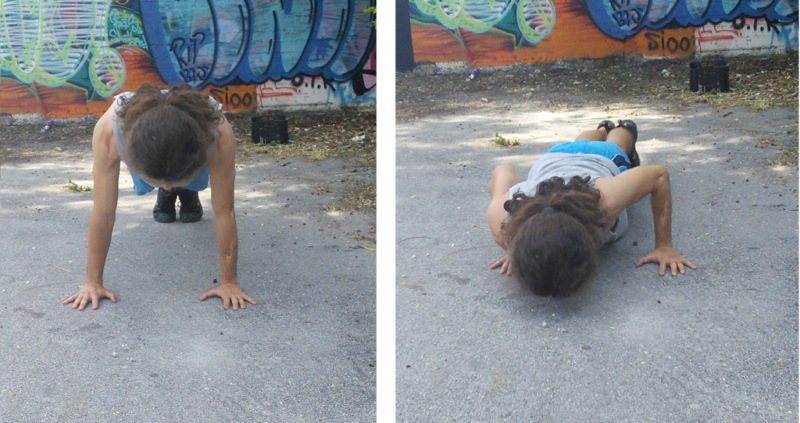 Perform push ups putting more weight on one hand [Picture 2]. After you have met the progression standard (see below), increase the distance by one palm (5 fingers). Repeat step two, until you are not able to meet the progression standard (see below) in the current progression. Then instead of 5 fingers, start increase the distance by 1 finger. When you reach the point where your assisting arm is straight in the bottom position [Picture 3], then instead of increasing the distance start to practice on the fingertips [Picture 4] for the assisting arm and gradually reduce the fingers used. Or else you can start working on the unilateral progressions. In each progression, you should be able to do 3×4 per side. If you are not able to do that, you have increased the difficulty too much, go to step 3. If you are not able to perform the necessary reps while you have increased the distance by only one finger, then you should start training with 3×3 per side. Deloading and moving to easier progressions will also help. There are many ways to increase the distance of your arms and measure it. I like to use a wall and my arms because I can do it anywhere without equipment and it’s simple. Place one of your hands down with the side touching the wall (this is a distance of 5 fingers). Place your other arm next to it and now while leaving the 2nd arm on the ground, go into the push up position with your arms shoulder width apart. Move your arm, that is close to the wall, right next to the wall. You have now increased the distance by 5 fingers. Find an elevated surface that is approximately hip height. Perform OAPU on this surface [Picture 5]. You should be able to do 5×5. If not then go to #1 progressions. Gradually reduce the height of the elevated surface [Pictures 6], while performing sets of 5×5 on both sides. When you reach a point where you are unable to continue with 5×5, use 5×3/ 3×5, and lastly 3×3. You should aim to increase the difficulty by reducing the elevation by approximately 5 cm. I used books to accomplish this. If you can’t find a way to decrease the height by such amount, then it will be difficult to maintain the 5×5 scheme. So you can start with fewer reps on the lower level (at least 3×3) and then increase the difficulty when you reach 5×5. If you are close to the ground then 3×3 is fine. The tempo I used to achieve this skill was 1,1,1,0. In the deload weeks, you can use slower tempos, such as 2,2,2,0 or 4,2,4,0 with easier progressions, to perfect your form. Changing the tempo from time to time can also help you prevent boredom. If you are going to use slower tempos, keep in mind that you will not be able to complete as many reps (obviously). Before continuing, you should understand that this training plan is only focusing on the development of the skill and it’s not complete. You should include pulling, core, leg, and conditioning exercises to your training plan as well.For this skill, I recommend training 4 times/week. You are going to have 3 strength sessions focusing on progressing and one focusing on the assisting exercises. If this is too much for you, you can alternate between assisting and progressive exercises or use 2 progressive and one assisting. During the deload week, you are going to reduce the load by practicing with a progression that is easier by 2-3 steps (depending on the actual progressions you used) than the one you practiced during the last week. Keep practicing with this progression for the whole deload week.